The M1 3D printer was designed to address issues of slow speeds typically seen in 3D printing. 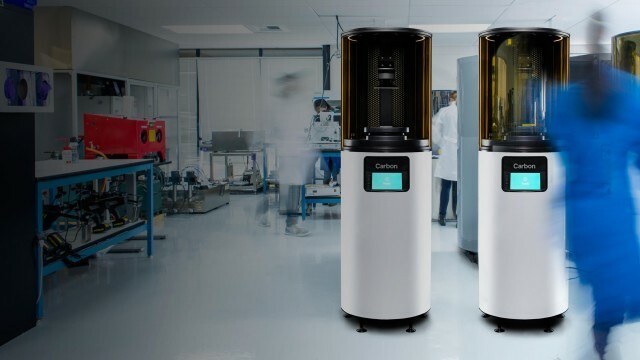 The flagship product of Carbon, the M1 uses a proprietary technique dubbed Continuous Liquid Interface Production (CLIP) to 3D print photopolymer materials at speeds 25 to 100 times faster than other technologies on the market. At the same time, Carbon claims that objects produced by the M1 exhibit mechanical properties comparable to parts made with injection molding. These features, coupled with the release of five different resins for use with the system, make the M1 ideal for short-run, custom manufacturing and prototyping of plastic objects. The M1 relies on a custom LED light projector to cast masks of light onto a vat of ultraviolet-sensitive resin (also known as a photopolymer). The light hardens the resin onto a printbed, which is lifted out of the vat layer by layer. Between the photopolymer and the projector is an oxygen-permeable window that creates a layer of uncured resin allowing for ultra-fast 3D printing. The CLIP process also results in objects fabricated with visibly imperceptible layers, typically seen with many other 3D printing technologies. The lack of obvious layers has significance on the microscopic level, where there are no pores that might contribute to the weakness of a part. This interior makeup is consistent in every direction, providing further strength, and the addition of a heat-activated element to the chemistry of the resins results in additional strength as well. The printer will have a build volume of 144 mm x 81 mm x 330 mm, which is relatively substantial compared to something like the Autodesk Ember DLP 3D printer, which measures roughly one-half the size at 64 mm x 40 mm x 134 mm. Other specifications include a billet aluminum platform, a foot-activated door and a cassette that includes the oxygen-permeable window, which is described as “easy to clean.” The M1 has its own built-in server, but also connects to a cloud-based server through its onboard Wi-Fi for cloud control and software updates. This also allows for remote diagnostics and support on the part of the Carbon team. Along with the system itself, Carbon has announced a variety of five different materials for use with the M1. This materials portfolio is likely to grow even further, given Carbon’s recently announced partnership with Kodak. Together, the two firms will explore the development of new materials to expand the applications for which CLIP might be useful. CEO Joseph DeSimone is also considering the launch of a materials marketplace for chemists to sell their own resins for CLIP systems. In order to understand the ability of the M1 to produce parts resembling those made with injection molding, Ford Motor Company began experimenting with the prerelease version of the technology last year. To do so, Ford produced various components and matched them against parts made with traditional 3D printing processes. These include elastomer grommets designed to protect wiring inside of the door of the Ford Focus Electric, as well as a damping bumper part for the Ford Transit Connect and an oil connector for a V8 engine. In all of these instances, Ford engineers were able to produce prototypes much more quickly than with other 3D printing processes and their parts more accurately resembled the injection molded components that would be mass manufactured in the end. In the case of the grommets, the pieces were fabricated in one-third of the time compared with other 3D printers. 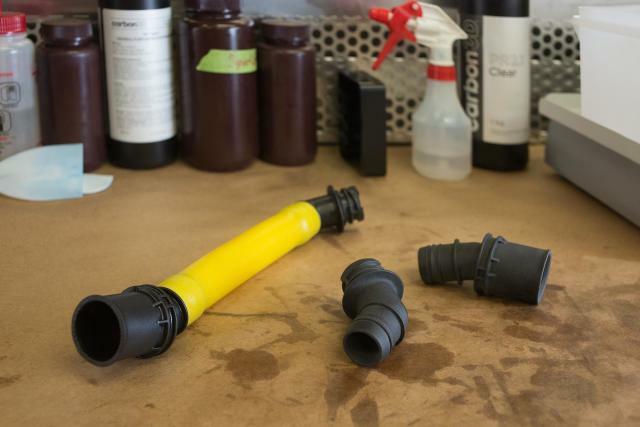 For the oil connector, Ford utilized Carbon’s rigid polyurethane and elastomer materials to create a component that solved an engineering problem associated with a new vehicle design. Due to the speed and materials available with the M1, the engineering team was able to design, prototype and manufacture the part, connecting the oil fill tube to V8 engine without being forced to redesign major components in the vehicle. Materials: General-purpose resin (PR) available in cyan, magenta, yellow, black, white and gray, but can also be combined to create new colors; polyurethane-based resin (RPU), durable and abrasionresistant for industrial parts with strong mechanical properties; flexible polyurethane (FPU) meant to be semirigid, while also tough; elastic polyurethane material (EPU) for producing objects that can resist tear but remain flexible; cyanateester material (CE) designed to be strong, tough and resistant to high temperatures. Machine Price: $40,000/year (three-year minimum), which includes one build platform, two window cassettes, a resin sampler pack and an initial supply of cleaning and safety items, plus $10,000 installation and training fee ($12,000 for accessories package). Resins range from $99 to $399 per 800 mL bottle or $315 per 3.2L bottle for some materials. Who Should Use the M1: The M1 may be one of the fastest 3D printers on the market, making it ideal for anyone for which speed is a necessity. Due to the performance-grade materials already released and in development, the M1 is capable of creating prototypes that accurately reflect injection-molded, mass-manufactured end parts and may even be useful for short-run production as well. Why You Wouldn't Use the M1: If speed is not of the utmost importance to your operation, there are other machines capable of high-resolution parts at a lower price point—but without the ultra-fast turnaround. Those that simply require an aesthetic or rough prototype may not need the engineering-grade materials that accompany the M1. 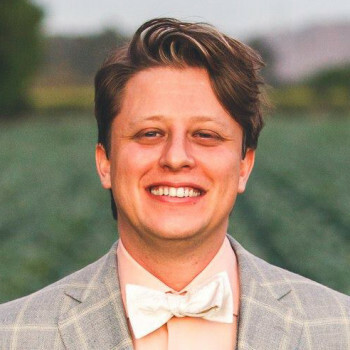 Michael Molitch-Hou is a 3D printing specialist and the founder of The Reality™ Institute, a service institute dedicated to determining what’s real and what’s not so that you don’t have to. He is a graduate of the MFA critical studies and writing program at CalArts, and a firm advocate of world peace.